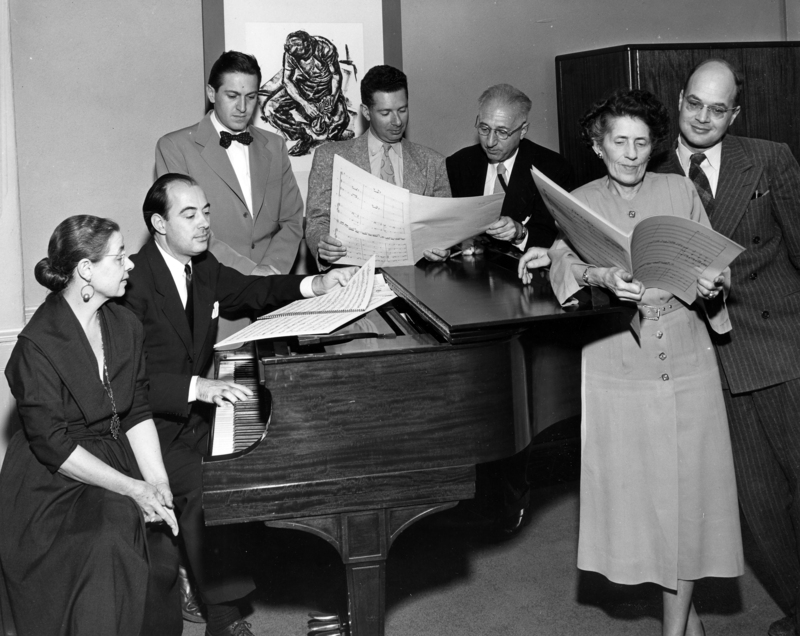 From left to right: Julia Howell Overshiner, Halsey Stevens, Leon Kirchner, Ellis B. Kohs, Ernest Kanitz, Mabel Woodworth, Ingolf Dahl. For generations, many of America’s most beloved contemporary composers have developed and honed their talents at USC as students and faculty of the USC Thornton Composition program. The above photograph, taken in 1952, shows just a few of the many composers who have mentored and taught USC music students. Julia Howell Overshiner was one of the first theory students in the USC School of Music and also studied composition with famed composer Arnold Schoenberg. Overshiner taught at USC from 1920 until 1955, and also served as chair of the school’s Department of Theory and Composition from 1923 until her retirement. Halsey Stevens, a professor of composition at USC Thornton for over 30 years, served as a mentor to USC Distinguished Professor Morten Lauridsen, current Composition chair Donald Crockett, Houston Bright and other composers. His works have been performed across the globe, and he was frequently commissioned by academic and professional organizations such as the San Francisco Symphony and the National Endowment for the Arts. He passed away after a long illness in 1989. Leon Kirchner, a Pulitzer Prize-winning composer of contemporary classical music and a former student of Schoenberg, taught briefly at USC in the early 1950s. Ellis B. Kohs taught at Wesleyan University, College of the Pacific and Stanford University before joining the USC faculty in 1950. In his nearly four decades as a faculty member, Kohs chaired the Department of Theory and Composition in USC’s Thornton School of Music for more than 20 years. USC commissioned a violin concerto from Kohs as part of the university’s centennial celebration in 1980, and the work was performed by the USC Symphony and soloist Eudice Shapiro under the direction of Daniel Lewis. Austrian composer Ernest Kanitz first arrived at USC in the summer of 1945 to lead a course on Mozart for another USC School of Music professor who fell ill and was unable to fulfill his teaching duties. Although his time at USC was to be temporary, Kanitz remained at the school for fourteen years before retiring in 1959. During his time at USC, he wrote a textbook on counterpoint that became well-known among educators during the mid-20th century. Mabel Woodworth was a bright, promising young choral composer when she joined the USC School of Music faculty in 1925 under the direction of Overshiner. She remained at the school until 1955. German-born composer Ingolf Dahl immigrated to the United States in 1939, settling in Southern California. There he came to know many other European composers living in the area, including pillar figures Stravinsky and Schoenberg. In 1945, he was hired to USC’s music faculty, a position he held until his death. He was influential in the education of many noted American musicians, including Michael Tilson Thomas, William Hall, and Morten Lauridsen. Beyond teaching composition, Dahl also conducted the school’s symphony orchestra and taught theory, conducting and music history. USC’s Doheny Memorial Library holds the Ingolf Dahl Archive, which holds many of his scores, manuscripts and diaries. Dahl died while in Switzerland in 1970.